As part of the Decade of Centenaries, the Commonwealth War Graves Commission, with the support of the Irish Government, has commissioned Commemorative Plaques for all 24 recipients of the Victoria Cross during the First World War, born in the Republic of Ireland. 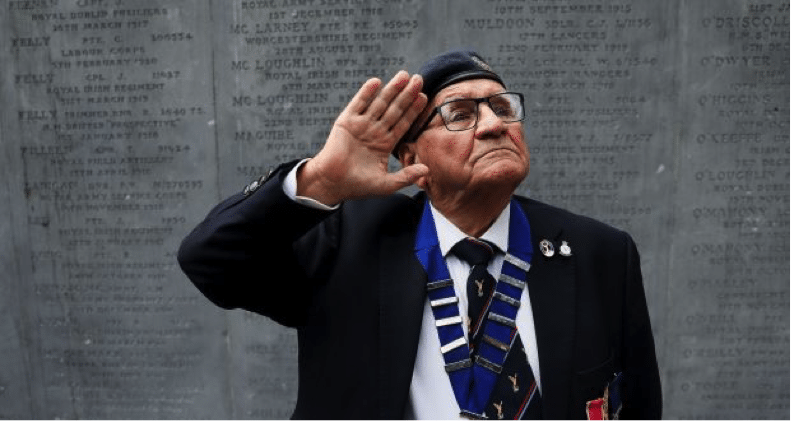 The programme associated with the Commemorative Plaques includes a ceremony taking place on the anniversary of the historic action for which each Victoria Cross was awarded. Under the auspices of the Department of Defence, supported by the Glasnevin Trust, the Minister of State with Responsibility for Defence, Mr Paul Kehoe TD unveiled a Commemorative Stone in honour of Major Edward ‘Mick’ Mannock VC, marking the 100th Anniversary of his death, at the Cross of Sacrifice, in Glasnevin Cemetery, on 27 July, 2018. The Honour Guard was drawn from personnel of the Air Corps, and the Colour Parties were provided by the Air Corps and Royal Air Force Association. Corporal Michael J. Whelan recited his poem “When We Flew” and provided a historical reflection on the interface between the Royal Air Force and the Irish Air Corps. Wreaths were laid at the Cross of Sacrifice by Minister Kehoe, the British Ambassador to Ireland, H.E. Mr Robin Barnett, the Chief of Air Staff, Air Chief Sir Stephen Hiller, and Brigadier-General Sean Clancy, GOC Air Corps. A Piper’s Lament, the Last Post and Reveille were rendered by the Defence Forces School of Music. As a member of Government it is my great privilege to lead and partake in events that provide us with an opportunity to look back on the journey we have taken with a strong focus on our joint history and shared experiences. Events such as today prompt us to recall shared loss of loved ones, while bringing to mind the sacrifice, courage and idealism of our forebears who laid the foundation for the freedoms we enjoy in our time.” He went on to say “it gives me great pleasure to be unveiling the V.C. stone here today which will act as a lasting testament to the bravery and heroism of Major Edward “Mick” Mannock VC. If you want to get an insight into the complexity of our history in the decade leading up to up to our Independence even a shallow dive into the life and times of “Mick” Mannock will open your eyes. The son of a bigamist, deserter, Corporal, raised by his abandoned Ballincollig mother as a Corkman, he fended for himself from an early age. It was not just his severe astigmatism in his left eye which made him atypical of his fellow flying Officers. He was an Irish Nationalist, a home ruler, a trade unionist and a socialist who believed the World War would finally give the “downtrodden” their chance. 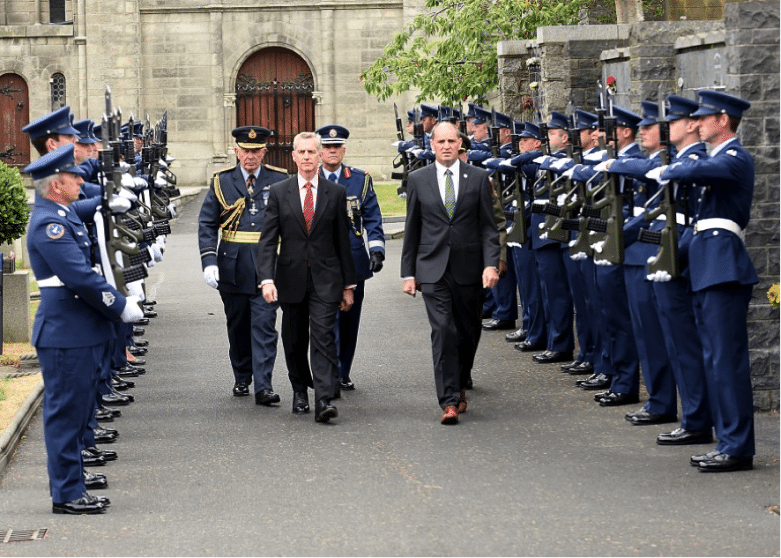 The British Ambassador to Ireland said that he was honoured to be involved in such an important commemoration at Glasnevin Cemetery, and was delighted that the Chief of the Air Staff, Air Chief Marshal Sir Stephen Hillier, was able to attend and recognise such an important officer in the Royal Air Force’s history. The attendance also included Lt Col Ken Martin (Retd) President Royal British Legion, Mr Alan Harrison President Royal Air Force Association, Brigadier-General Paul Pakenham (Retd) Chairman Military Heritage of Ireland Trust, and representatives from the Department of Defence, the Defence Forces, the Organisation of Ex-Servicemen and Women, the Irish UN Veterans Association, and the Association of Retired Commissioned Officers. Edward Mannock was born on 24 May 1887, at Preston Barracks Brighton, to his mother Julia (nee O’Sullivan) from Ballincollig, County Cork, and his father Corporal Edward Mannock, Royal Scots Greys. In 1893, his family moved to India, and later returned to England. Edward had a tough childhood, working to alleviate the family’s poverty. In 1914, he found work in Turkey as a telephone engineer. With the outbreak of the First World War, along with other Britons, he was interned, but returned to Britain in April 1915. On 22 May 1915, he joined the Royal Medical Corps, later transferred to the Royal Engineers, and thereafter to the Royal Flying Corps. In March 2017, he qualified as a pilot and was posted to No 40 Squadron in France. In February 1918, Captain Mannock joined No 74 ‘Tiger’ Squadron. A natural leader, he deliberately set up kills for new pilots to build squadron morale, whilst also adding to his own impressive number of downed aircraft. On 21 June, following promotion, Major Mannock commanded No 85 Squadron. Major Mannock’s last flight was on 26 July 1918. After attacking a German plane, he followed it down and was hit by ground fire. His left wing detached and he spiralled out of control, crashing in a ball of fire. Neither his body nor his grave has ever been conclusively recovered. 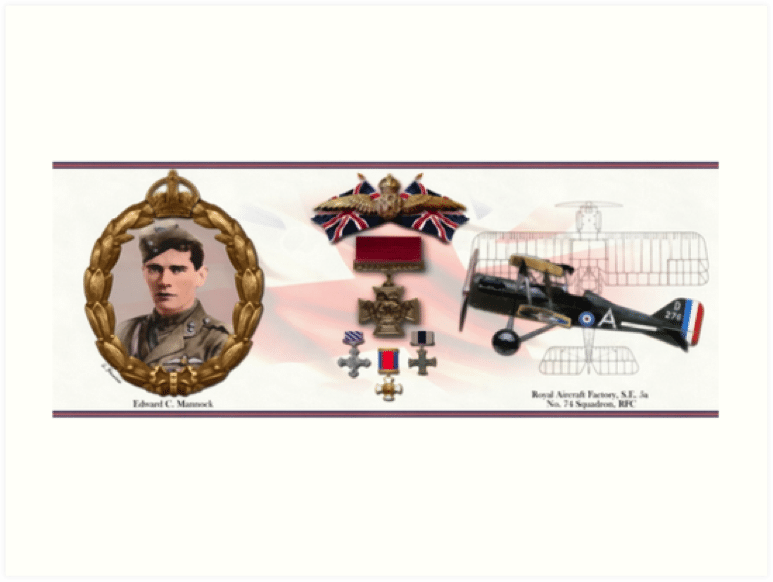 One of the greatest fighter aces of the First World War, Major Mannock’s Victory Cross was posthumously awarded for the 9 German aircraft he shot down in June and July 1918. During his career as a pilot, he accounted for at least 61 downed aircraft. On the 17th June, 1918, he attacked a Halberstadt machine near Armentieres and destroyed it from a height of 8,000 feet. On the 7th July, 1918, near Doulieu, he attacked and destroyed one Fokker (red-bodied) machine, which went vertically into the ground from a height of 1,500 feet. Shortly afterwards he ascended 1,000 feet and attacked another Fokker biplane, firing 60 rounds into it, which produced an immediate spin, resulting, it is believed, in a crash. On the 14th July, 1918, near Merville, he attacked and crashed a Fokker from 7,000 feet, and brought a two-seater down damaged. On the 19th July, 1918, near Merville, he fired 80 rounds into an Albatross two-seater, which went to the ground in flames. On the 20th July, 1918, East of La Bassee, he attacked and crashed an enemy two-seater from a height of 10,000 feet. About an hour afterwards he attacked at 8,000 feet a Fokker biplane near Steenwercke and drove it down out of control, emitting smoke. On the 22nd July, 1918, near Armentieres, he destroyed an enemy triplane from a height of 10,000 feet. Military Cross. Gazetted 17 September, 1917. 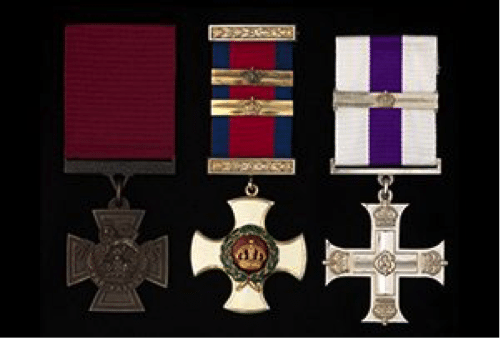 Bar to Military Cross. Gazetted 18 October, 1917. Distinguished Service Order. Gazetted 16 September, 1918. Bar to Distinguished Service Order (1st). Gazetted 16 September, 1918. Bar to Distinguished Service Order (2nd). Gazetted 3 August, 1918. This highly distinguished officer, during the whole of his career in the Royal Air Force, was an outstanding example of fearless courage, remarkable skill, devotion to duty and self-sacrifice, which has never been surpassed. Major Edward Mannock’s medals were purchased at auction, Sotheby’s, Billinghurst, West Sussex, 1992. They are on display in the Lord Ashcroft Gallery, at the Imperial War Museum, London. Memorials to Major Mannock can be seen at: Faubourg-d’Amiens Cemetery, Arras, France; Canterbury War Memorial, Kent; Canterbury Cathedral, Kent; Mannock House, Canterbury, Kent; Christchurch Gate, Canterbury, Kent; St Clement Danes Church, London; and RAF Museum, London.